Something Is Out There...: Welcome to the World TYME! Welcome to the World TYME! I have been given many blessings in my life. Above I have my sons and their children. 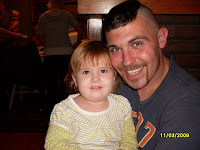 David, my oldest son is with his daughter Mylie, and Jon is with his new little son, Tyme. 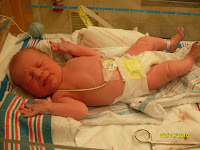 Tyme was born this morning, Feb 4, 2010 at 8:44am. Amber is doing fine, and both are excited about their new arrival. ME TOO! 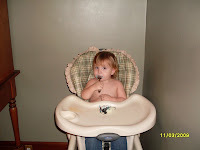 I have two grandchildren now, a boy and a girl. I also have 4 grandchildren that came with Davies marriage. Jon has Ambers two children besides Tyme. Both my sons have collectively, 8 children. WOW! Like I said, many blessings! Amber will be down for a few weeks but hopes to be back out there by April. In the mean time, WELCOME LITTE TYME !!! It is great to finally meet you! Congrats on the new baby ! Such a perfect little package. Lucky family!